Robert Burton, The Anatomy of Melancholy, (1621/1893). Browsing through the scientific research currently probing the depths of human thought and feeling, you are certain to find a surplus of information detailing regions of our brain that flash on in response to a variety of emotional stimuli like the lights on a switchboard. Away from the impassive gaze of an MRI scanner however we doubt many of us experiences love, hate, stress or serenity as a sensation emanating any particular part of twists, folds, lobes and cortices that form the human brain. Instead we experience the pounding of our heart, the butterflies in our stomach or the flush of our cheeks. Visceral and tangible emotions are felt, not thought. Recent research by psychologists in Finland goes some way to support this body-centric perspective of emotion. 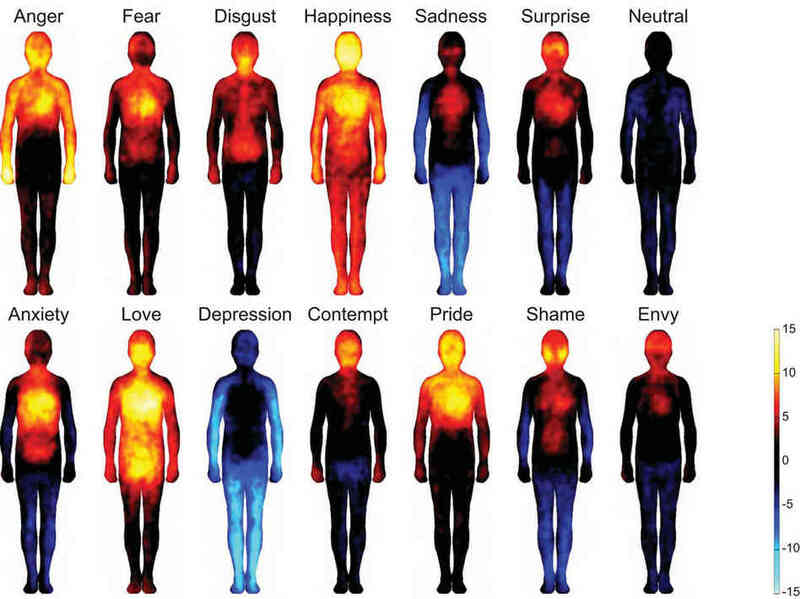 Over 700 hundred individuals were induced to feel a variety of emotional states and then asked to colour the bodily regions they felt were engaged by their feelings, the result of which are shown below. This principle of a connection between physical and mental states is by no means a new idea. Almost two and a half thousand years ago the Greek physician Hippocrates was a firm follower of humorism, a concept suggesting that differing combinations bodily fluids have distinct effects on human temperament and behaviour. Blood (rather than the brain) seemed to be the bodily fluid carrying feeling and emotions. This is a rather interesting point to consider since many of the words we use today to describe our own personalities, such as sanguine, phlegmatic and melancholy have their origins in this ancient medical theory. Similarly, we use the expression “It’s in my blood” when we talk about attitudes and associated emotions. As is often the case with an incontrovertible dogma, this dominating view underwent a dramatic decline following a spate of discoveries that began to reveal the architecture of both our brain and body down to the cellular level. Most significantly the development of the aforementioned Magnetic Resonance Imaging (MRI) by Nobel laureates Paul C Lauterbur and Peter Mansfield in 2003 has allowed us to examine the flashes and pulses of brain activity both in real time and exquisite detail. Accompanying this upsurge of knowledge about the brain and its physical machinations has come a tendency to regard this organ as the sole arbiter of human thought and feeling, processing events from our external environment into a set of defined emotional states which in turn activate a corresponding physical response. While there is a wealth of scientific and epidemiological research supporting this top down perspective of emotional reaction there is a growing body of evidence suggesting the reverse: A bottom up response in which events internal to our body yet separate from the brain may have a substantial influence on our mood. One of the best examples of this bottom up response is the recent flourishing of research on the role our gut bacteria play in regulating our emotions. Emotional state has been established as having an influence on the correct functioning of our digestive tract (a connection referred to as the brain-gut axis) it is for this reason that irritable bowel syndrome is often treated with anti-depressants. However it also seems the contrary may also be true. Germ-free mice (which have no intestinal micro flora) display a highly exaggerated response to stressful stimuli when compared to animals with a normal compliment of gut bacteria (for more information visit Prof. Graham A.W. Rook web page on the “Old Friends” mechanism). These mice also possess a substantially underdeveloped immune system, which brings us on to two recent studies carried out within our own lab, demonstrating how the presence or absence of specific types of immune cells within the body can greatly influence emotional behavior (Piras et al., 2013; Rattazzi et al., 2013). Immune cells are our personal bodyguard against the “dangers” of the outside world and circulate through our body using the fascinating mix of water, salt, fat and proteins we call blood. Among this pantheon of microscopic workers one cell type is unique not just in its function but also in the way it communicates and interacts with the various tissues and organs it passes through as it patrols the body. Named after the thymus, the butterfly shaped organ from which they originated helper T cells (often referred to as CD4+ T-cells) act as both mediators and moderators of the immune response. Constantly assessing their environment this ruling class of cell uses a series of chemical signals to direct a cellular plan of action tailored to resolving an insult to the immune system, be that injury, infection or otherwise. Remarkably, these cellular commanders are able to store key information on the immunological events they experience allowing them – if met by the same problem again – to react faster and more efficiently to it. Adaptive, reactive and able to co-ordinate other immune cell’s actions based on priority or need it does not seem too much of a stretch to describe T cells as the ‘thinking’ part of the immune system, comparable (albeit in a more diffuse way) to the brain. Clinical studies, experimental evidence and patient’s accounts often describe the damaging effect of transitory or prolonged absence of T cells on their emotional wellbeing. Cyclosporine, a drug widely used in organ transplantation functions by reducing the activity of the immune system by preventing the growth and action of T cells. This drug has been shown to induce a range of neuropsychological problems ranging from depression to anxiety both in human patients and experimental animals. Chemotherapy, a catchall term for a variety of drugs used to treat cancer is notorious for decimating the patient’s resident population of immune cells it also commonly causes acute psychological complications too severe to be considered a reaction to the treatments physical effects alone. The reverse is also true. Adult patients suffering from anxiety and obsessive-compulsive disorders present a significantly reduced numbers of helper T cells when compared to the healthy Individuals. In a recent study it has also been shown that there is an inverse relationship between CD4 lymphocyte count and hospital-associated anxiety and depression. While it seems clear that these cells are having a tangible effect on our emotional state. The key question we are now trying to address is how? In attempting to answer this question we performed a battery a psychological tests on groups of mice that had been genetically engineered to either have no T cells at all or just T helper cells (several varieties of T cells circulate our body). We observed that with a complete absence of lymphocytes mice exist in a permanent state of high anxiety. With a strong tendency towards obsessive compulsive behaviour, as demonstrated using a marble burying experiment. Unable to cope with the aberrant presence of these glass balls in their enclosure these mice will bury them out of sight (and out of mind one can imagine) using whatever bedding or burrowing material that is available to them. A key issue facing the thousands of individuals in the UK suffering from anxiety and obsessive compulsive disorders is their diminished ability to perform day to day activities that might agitate their condition e.g. leaving the house, social situations, throwing things away etc. Our mice lacking T cells presented comparable problems, showing a significant reduction in their ability to effectively care for themselves, failing to groom properly and unable or unwilling to complete the construction of their own nests. Each of these emotional maladies; the anxiety, OCD and lack of self-care was drastically decreased in the mice that possessed the helper T cell subset. This presented the exciting suggestion that these cells may play an important role not just in stabilising our immune response but our emotional state as well. Driven by these results we began investigating whether or not these cells were capable of exerting their influence directly upon the brain. Using a powerful analytical tool referred to as a genetic micro-array we were able to sift the minds of our mice, pin-pointing the shifts and fluctuations of gene expression between the brains of different animals. Of the 35,000 individual genes looked at we identified over 6000 to be differentially expressed between normal mice and those lacking T cells. Of these genes many have already been described as being directly involved in the progress or instigation of several mental disorders. Others have provided tantalising clues as to the origin of other less well-defined cognitive and emotional illnesses. Most strikingly for us, these differences in gene expression were strongly reduced or abolished completely in the brains of mice with T helper cells thus providing new and compelling evidence that these cells are both the arbiters of immunity and emotion. And this is of course just the tip of the iceberg for this vast and interconnected field of research. Studies in other labs have demonstrated that T cells rapidly mobilize to the skin and lungs of individuals suffering the intense and acute anxiety. This might be one of the explanation why patients suffering panic and anxiety attack often feel “out of breath” or that problems get “under their skin” when there is something that they cannot be rid of. Further work by Prof Michael Schwartz (Weizmann Institute of Science, Israel) and Prof Jonathan Kipnis (University of Virginia, USA) has also suggested the possibility that T cells may play a vital part in the brains recovery from mental challenges such a stroke and physical trauma as well as serving an important role in the retention of memory and mental capacity as we grow older. Happiness and healthiness go hand in hand. N.B: The images preceding several of the paragraphs are part of a project by graphic designer Orlagh O’Brien titled emotionally vague. Each represents the attempts of 250 individuals to draw how they feel emotions on their body overlaid on top of one another. The emotions displayed are anger, love, fear, sadness and joy respectively. 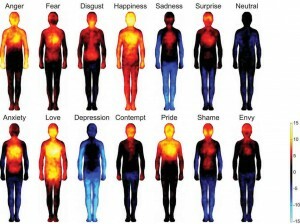 It is interesting to note the resemblance these images show to those created in the ‘Body Maps of Emotions’ study. The figures “Have you lost your marbles?” and “Immunosuppression and the lack of self care” contain a photo of “Shape of Despair” by Stefano Costanzo and a photo of “Chernobyl/Pripyat Exclusion Zone (041.8112)” by Pedro Moura Pinheiror, respectively. Piras G, Rattazzi L, McDermott A, Deacon R, D’Acquisto F. “Emotional change-associated T cell mobilization at the early stage of a mouse model of multiple sclerosis.” Front Immunol. 2013 Nov 21;4:400. doi: 10.3389/fimmu.2013.00400. Rattazzi L, Piras G, Ono M, Deacon R, Pariante CM, D’Acquisto F. “CD4⁺ but not CD8⁺ T cells revert the impaired emotional behavior of immunocompromised RAG-1-deficient mice.” Transl Psychiatry. 2013 Jul 9;3:e280. doi: 10.1038/tp.2013.54. This entry was posted in Emotions and Psychiatry, Research reports and tagged anxiety, brain, immune system, OCD, psychoimmunology, T-cells by Fulvio DAcquisto. Bookmark the permalink. I’d be interested to know what the intended treatment would be for individuals lacking T cells. There seems to be mounds of anecdotal evidence linking specific diets (generally low carbohydrate) to improvement in digestive and auto-immune disorders as well as easing of autism symptoms amongst some children. Are there likely to be any large scale trials of diets such as the SCD or GAPS?